I tend to not visit chain restaurants too often. And this blog is really about promoting locally owned and operated places. But every once in a while, I figure an exception can be made. Jasper’s, located in The Domain in North Austin, is one of those exceptions. It is part of a chain (there are Jasper’s in Dallas and Houston), but chain restaurants only become chains if they’ve got a good thing going on. And this place does – especially for happy hour. Any place that states “If we’re open, it’s Happy Hour” is okay in my book! The happy hour deal only applies to seating at the bar or on the patio, but that’s fine because that’s where all the action is anyways. Jasper’s has a great outdoor patio and a very nice bar with comfortable seating. Their happy hour menu is great, not only for drinks but food as well. The list of $5 edibles is substantial and delicious. 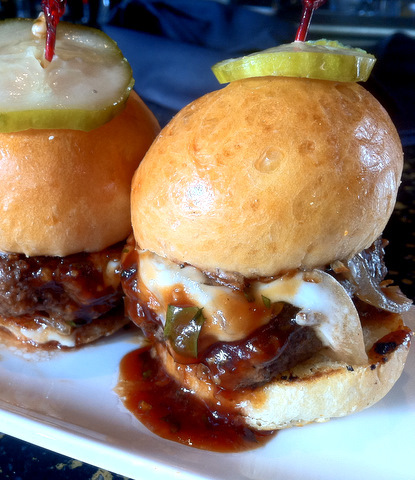 I tried the beef sliders- a pair of cute mini burgers topped with onion and pepperjack that were juicy, flavorful and a little messy (messy burger = good burger). Other items on the happy hour menu include smoked brisket tacos with tomato avocado salsa, sausage pizza, ginger citrus marinated pork satay and a few others. Plenty of food for a meal – and all at only $5 each! Now on to the real reason why people go to happy hour – the drinks! During happy hour (which really is all day everyday, remember?) they offer $2 off of specialty cocktails, beer and wine. They also have a list of $5 martinis. 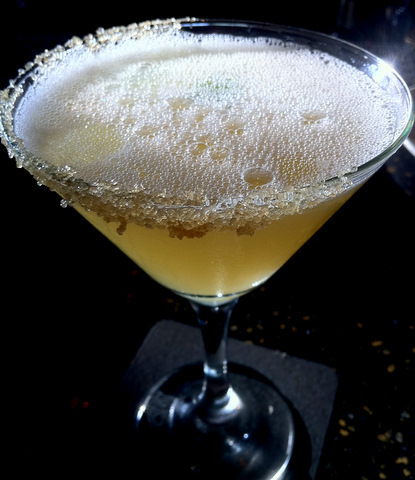 I tried the Skinny Margatini – tequila, agave nectar and fresh lime juice. Not too sweet, not too tart and a perfect way to start off my weekend. I thought Jasper’s was a classy place with a great patio, good food and drinks at a good price and friendly staff. It’s a fun and lively spot – good for whenever you are in the mood for happy hour. And who doesn’t love that!